Jesus is deity (or even God for that matter), we do not make him the Father! IS IN EVERY WAY LIKE THE FATHER but he is not the Father". our Lord, which was made of the SEED of David according to the flesh." 2:6) which means that she went through all the normal stages of pregnancy. being with child cried, travelling in birth, and pained to be delivered." day, he went out, and departed into a solitary place, and there prayed." "God" Was a Loyal Subject:  Jesus was a good citizen, he was loyal to Caesar. The Powerless "God" (Jesus) said:  "I can of mine own self do nothing." 8:23), "And he was in the hinder part of the ship, asleep on a pillow." 11:33),  "Jesus therefore again groaning in himself cometh to the grave." 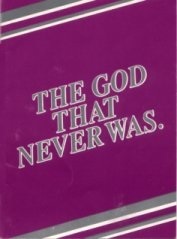 A Hysterical "God":  "And (he) began to be soreamazed and to be very heavy." him. And when they had blindfolded him, they struck him on the face." death." (Mark, 14:64). "They answered and said, he is guilty of death." The Dying "God":  "And Jesus cried with a loud voice, and gave up the ghost." The "God" That Was Supposed Dead and Defunct:  "Christ died." (Romans, 5:6). begged the body of Jesus. Then Pilate commanded the body to be delivered." what was done, he glorified God, saying, certainly this was a righteous man." Jesus did neither SHARE THE NATURE OF GOD nor is he IN EVERY WAY LIKE GOD. must admit that he is a polytheist, i.e., a believer in more than one God.